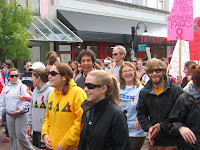 On Saturday, September 29th, University of Vermont students, faculty and friends marched in the annual AIDS Walk in Burlington, Vermont. 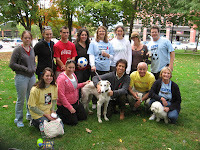 Organized by Vermont CARES, our team walked to raise money for the Futbol para la Vida HIV/AIDS prevention education project of Fundacion de Libertad. Futbol para la Vida is a member of the international Grassroot Soccer network, and includes programs that are currently running in dozens of bateyes in the Dominican Republic, run by peer educators from the communities of Batey Libertad and Saman/Caraballo (see September blog below). With much support from the upcoming November travel-study class f rom UVM to Batey Libertad, and with a huge thanks to Vermont CARES for letting us ride on their coattails, we raised over $2000 … and still counting. Thanks so much to our dozens of sponsors and to everyone who showed up for the walk on what turned out to be a perfect fall day in Vermont!